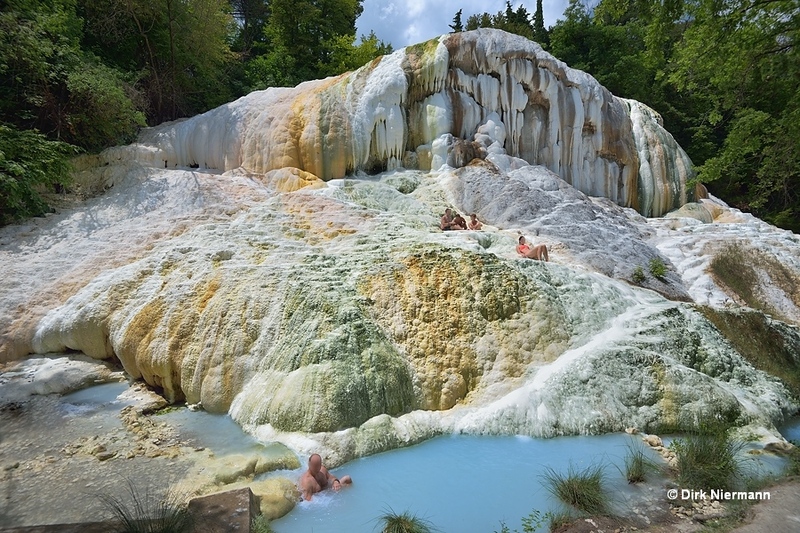 The hot springs of Bagni San Filippo are located on the eastern slope of the extinct volcano Monte Amiata at the periphery of Val d'Orcias rich forests. They are also not far from the western border of the Siena-Radicofani graben and the geothermal wells of the Mt. Amiata field. 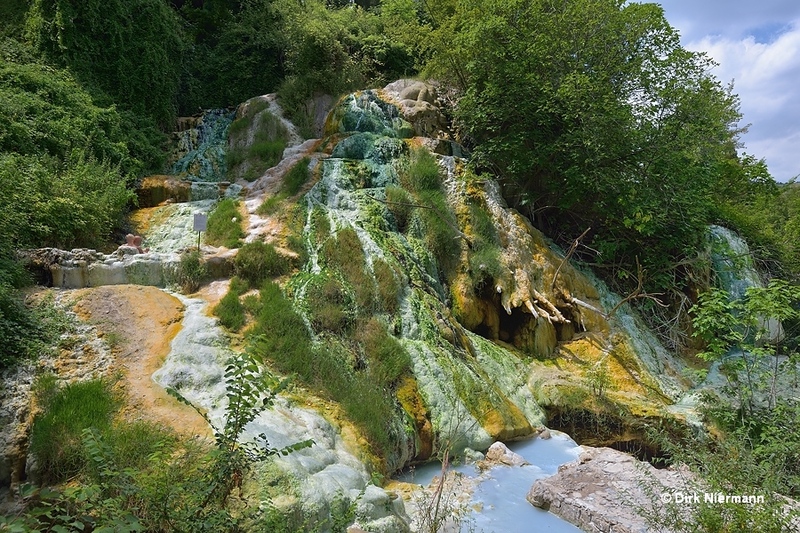 For thousands of years, in this area hot springs have built up several impressive travertine mounds of up to 30 m (100 feet) height. 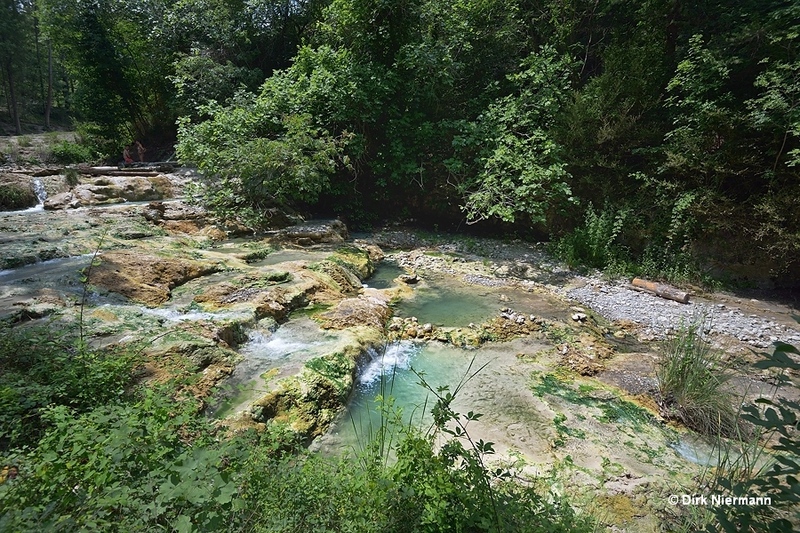 About 500 m (0.3 miles) west of the town center and at 100 m (330 feet) higher elevation as the nowadays active springs, there is the oldest known travertine deposit that has been dated at an age of 55,000 years. Since that time the main discharge level of thermal water has dropped to a height of presently 523 m (1,716 feet), whereas close to the oldest deposit only some reduced hot spring activity has remained. This area is privately owned and not open to the public. 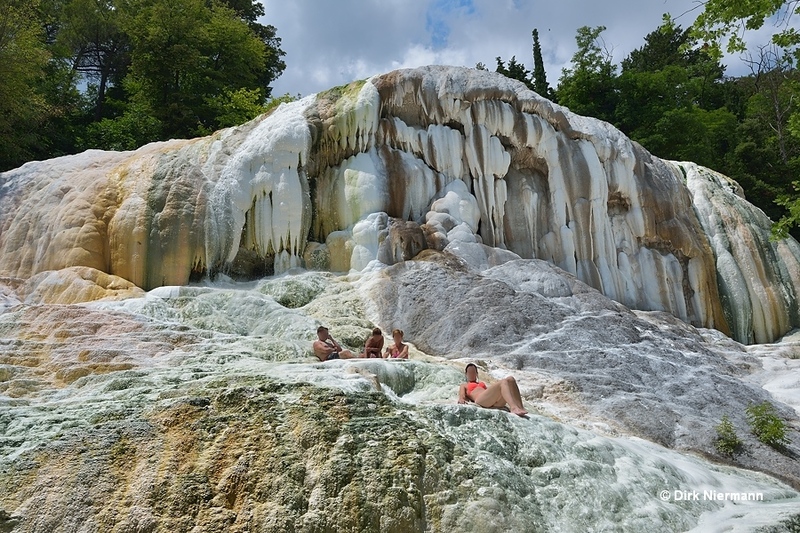 Currently, in total five hot springs are active in and around Bagni San Filippo. 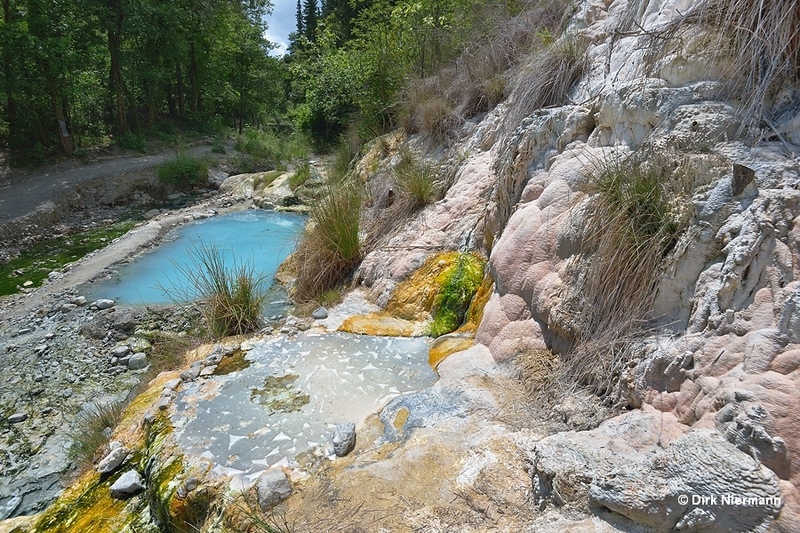 Their water discharges into the Fosso Bianco (White Ditch), a sequence of low cascades and shallow basins where the whitish blue thermal water drains just outside the eastern border of the village. A broad trail, branching off from the road called Via Fosso Bianco, leads down to the Fosso Bianco and the bright sinter formations alongside the ditch. After passing a gray and weathered travertine slope, runoff and collecting pools of the first active spring come into view. The spring itself is located inside the village on private ground and not accessible to the public, but its drainage water is conducted through a plastic pipe underneath Via Fosso Bianco to the top of the sinter slope. 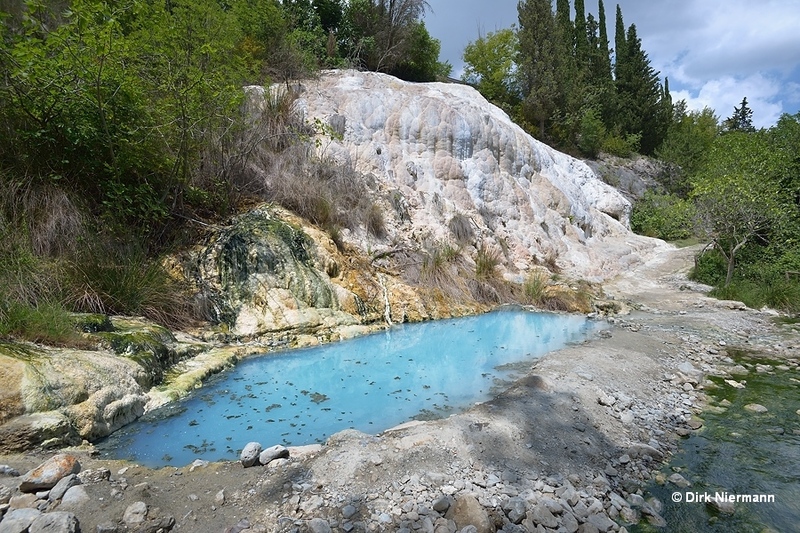 Due to a high concentration of carbonate and sulfate salts the water deposits large amounts of travertine at a rate of 3 - 5 mm (0.1 - 0.2 in) per day close to the vent of a spring. Depending on the individual spring it contains also various concentrations of hydrogen sulfide (H2S), thus emitting a smell of rotten eggs. The collecting pool on the next picture in front is also fed by its own small spring, recognizable by the bright orange biofilm of thermal bacteria. If you look closely at the pools surface you may notice a thin, ice-like layer, formed by so-called crystalline calcite rafts. To meet with the next sinter formations, you have to follow Fosso Bianco downstream in northern direction. Its shimmering greenish water flows through a park-like forest with a nice pattern of bright and shady patches. Downstream you reach one of the most yielding hot springs, gushing water at a rate of 20 liters per second (317 US gpm) at a maximum temperature of 50 °C (122 °F). It emerges just on top of the most impressive travertine formation, called Balena Bianca (White Whale) or Bocca della Balena (Whale's Mouth). But already in the medieval ages people have diverted most of its water into stone-built bathes at the site of the current Spa Terme San Filippo. Prior to this an impressive waterfall must have cascaded down the Balena Bianca. However, even nowadays there is still enough hot water flowing through a narrow channel to the Balena Bianca to keep the sinter fresh and enable further growth. Especially in the winter months there is less need of hot water in the spa terme, so more is left for the natural waterfall. This is the reason why the sinter surface in winter shows a far more expanded layer of orange-brown thermophilic microorganisms and green algae. A few feet farther downstream the next travertine slope shows up. It is fed by the outlet from the spa terme above and therefore receives plenty of thermal water. Nevertheless, even second-hand an impressive, natural looking travertin formation with some terracettes and pools has grown. Like all other pools around, they are intensely used for bathing.